Our farm is located 12 miles north of Stratford. We are at the Stratford Farmers Market selling Canada Grade A eggs year round, and a wide variety of garden produce in the summer. The brown laying hens are free-run, the eggs are graded in in our “on farm” licensed Grading Station. We offer brown and white eggs, from small to jumbo. 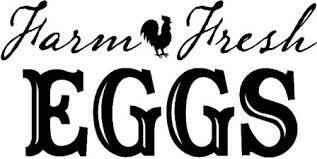 Come and enjoy fresh farm graded eggs! Product: Eggs, local garden produce, maple syrup and occasionally home baking.